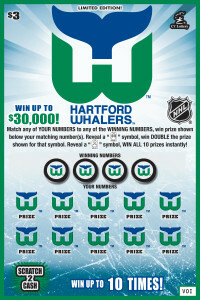 While the chances of an NHL team returning to Hartford are diminishing, it’s great to see the Hartford Whalers brand continue to live on. Whalers merchandise continues to be a hot seller and Brass Bonanza still plays loud and proud across various sports (and weddings). Speaking of which, don’t forget to start your holiday shopping early by visiting our Whalers Gift Shop for all your branded merchandise needs! All sales made through our site generate referral fees which help defray our hosting costs.